Chiltern Invadex has been helping to provide bathing solutions for domestic, healthcare and leisure environments for over 25 years. 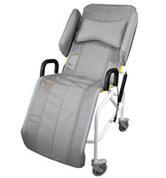 The AquaMaster Tilt in Space Shower Chair is the newest addition to the range. 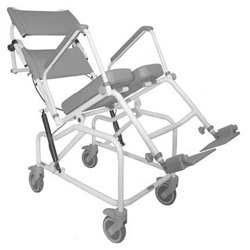 It has been developed in conjunction with healthcare professionals to create a chair which provides comfort and security for the user combined with ease of use. The white coated stainless steel frame not only provides a durable, corrosion resistant finish but also includes an anti-microbial additive to help protect against the risks of cross contamination. A dual gas spring assembly allows smooth operation via a single rear mounted control handle, providing a tilting angle of 0 to 30 degrees with an additional 10 degrees provided by the ergonomic angled backrest. The chair is available in two standard widths, 18" and 21", or as a special order to a user specific specification (subject to survey). 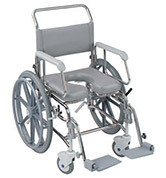 In addition, an extensive range of standard options has been made available to allow a large choice of seat, armrest, footrest and backrest configurations. 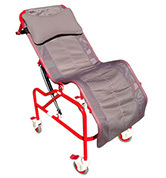 This is further complemented by a carefully selected range of accessories including fully adjustable head supports, foot trays, calf straps, pressure relief seating, side padding, harnesses and commode pans. 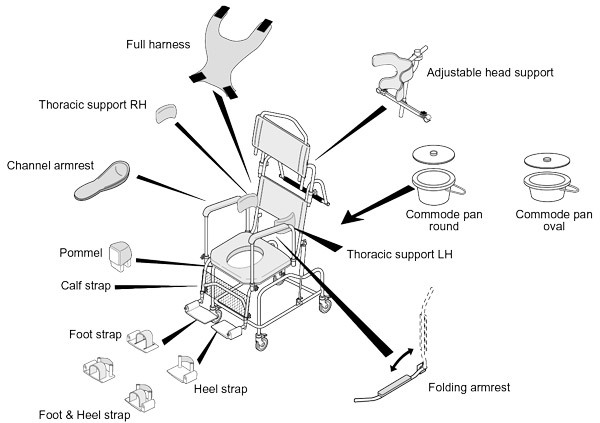 Seat, armrest and footrest configurations are retrospectively replaceable to allow the chair specification to be amended to suit degenerative conditions and to enable re-issue. 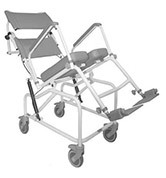 The AquaMaster Tilt in Space shower chair has been competitively priced, please contact Customer Services on 01869 365500 (option 1) for a quotation or to arrange a no obligation assessment. Designed and field tested in conjunction with Occupational Therapists and Healthcare Professionals. Offers a safe, controlled and comfortable showering position for those with severe physical conditions. Full range of aperture, horseshoe and flat padded seats available. Option for bespoke seating, including pressure relief foam. Armrest, footrest and backrest options. Dual gas rams to ensure smooth reliable operation. Stainless steel, electrostatically powder coated construction for strength and durability. Corrosion resistant stainless steel and nylon braked castors. Directional locking option available. 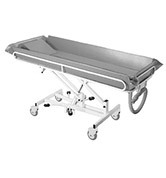 Commode cradle options for round or oval pan types. Also available as a tilting shower cradle. Free, no obligation technical survey.